All these fly boxes are imprinted with our Bear's Den logo designed by Pat Cohen. Made from tough, clarified polypropylene. 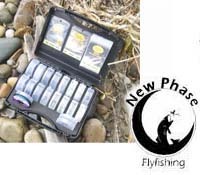 These 1/2" thick minimalist boxes will keep you loaded with midges and options while keeping the bulk down. Strong, durable, clarified ABS plastic boxes with positive snap tight latch and stainless steel hinge pins. High density, custom made, long lasting slit foam liner that will hold tons of flies. Rubber water tight gasket seals the box tight. These are some seriously tough fly boxes, stand on it, drop it, abuse it, and this box will come back for more. Similar design as our standard double sided waterproof boxes but made of much stronger polycarbonate. These double sided water tight boxes feature stainless steel hinge pins, secure latches and a high density rubber seal. For those looking for a small water tight box, this is it! Besides holding over 200 flies, it has a sure grip ribbed exterior and a positive latch. Trout, Steelhead, Bass, Blue Fill, Carp, a fisherman never knows what kind of fish he will be chasing from day to day. To be prepared, all fisherman need a "Go To box." A box that will allow you to fish for whatever and whenever the opportunity presents itself. The same rugged, stylish water proof box as the FG 1209, but with the "inline" foam inserts on both sides and no swing leaf. 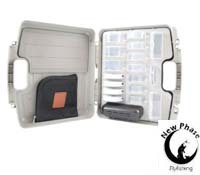 The extra middle space makes this box an excellent choice for various larger size flies, streamers, large dry flies, leeches, and steelhead patterns This is a rugged, durable, watertight box that anglers will utilize for years. The JamPac is an extremely versatile organizer, it's a great guide or boat box that fits nicely into boat bags and hatch compartments. 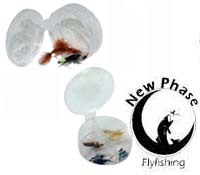 Its design allows anglers to separate different sizes and types of flies, split shot, indicators, floatants, etc. and then easily resupply each individual cup when needed. This is that mythical box you have dreamed of to carry everything you need for the whole trip. Forget fooling around with a bunch of loose gear. Just grad this one box and go. This double sided behemoth has extra depth to handle even the largest of flies. Heavy duty and waterproof. Go ahead, see if you can fill it up. Bears Den Signature Fly Cups. Available in 3 styles: Standard, Standard divided and Jumbo!